Click here to go to Eliezar and Mina Zavelsky's Family. 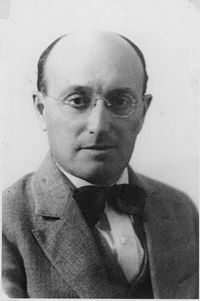 Elias was born in 1885 in Glukhov. He studied in the same Yeshiva as Zalman Shazar the second president of Israel. When he was a young man he left Glukhov in order to avoid going into the army and went to Grenoble France where he received his degree in five languages. His wife Esther Malkin was a graduated head nurse. When the Czar's army started to round up Russian citizens living in France he immigrated to Harbin, China. After that he went to Yokohama, Japan and then immigrated to America via San Francisco. Their son Alexander was born right after their arrival in San Francisco. In 1917 the family moved to Milwaukee where his cousins the seven Franklin brothers were living. 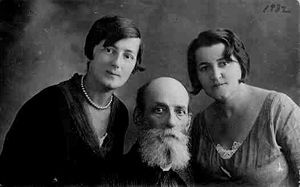 They immigrated to Palestine in 1932 where they were ardent Zionists and lived on a kibbutz for 30 years until 1962. Elias changed his name to Zavel upon moving to Israel. He later found out that Zavel meant manure in Hebrew and thus picked the new name of Ephrat. Elais was an ordained Rabbi at 26, but at 29 he became and atheist. He died of cancer in the sixties. Until two months ago, we knew nothing of any of the children of Berel, except for Elais. We hope to learn more about the family in the near future. 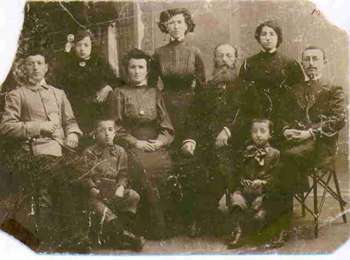 #1...The Family of Berel Zavelsky in Glukhov...1910. Standing: Mina, Hannah, Gitel, Hinda. 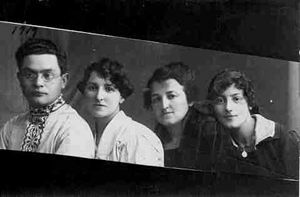 Middle row: Israel-Noah, Freida (Berel's wife), Berel, Elais Bottom row: Zavelleh holding sister Doba's photo, who was not present at the time and Moishe. Click here for larger photo. Alex was a special man. He was a senior technician in the Israel Aircraft Industry. He loved his country and was a dynamic person. Alex was extremely helpful along every step of preparing this family history. He was an artist who at the age of 80 was given his own show. 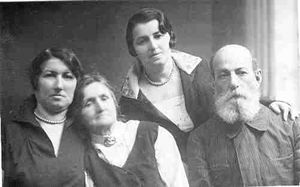 He married Mania Baran and they had three children. Mania passed away in 1984 and Alex married a second time.